Matt Damon really should have listened to Matt Damon. If you look at the first three movies, we kind of pounded that idea of identity and amnesia into the ground. We really got everything out of it that we could. That question never quite leaves you during the film’s running time. Sure, director Paul Greengrass hasn’t forgotten how to craft a riveting action sequence. And Damon is one of the few actors who can command a screen without saying a syllable. The core story remains essentially unchanged. No matter how rigorously Greengrass shakes his camera, that redundancy won’t fade away. Damon remains Jason Bourne, a former government agent whose old life was wiped clear after he entered a secretive government program. Julia Stiles returns as one of Bourne’s former colleagues. Her character steals critical government information as the story opens. And guess who she reaches out to? Hint. It’s not Renner. RELATED: Did You Miss 2015’s Action Movie Sleeper? Bourne is patching together pieces of his past, again, when she reaches him. As a result, he U.S. government wants him eliminated. Again. He knows too much. Again. CIA director Robert Dewey (Tommy Lee Jones) heads the Bourne Removal Unit. 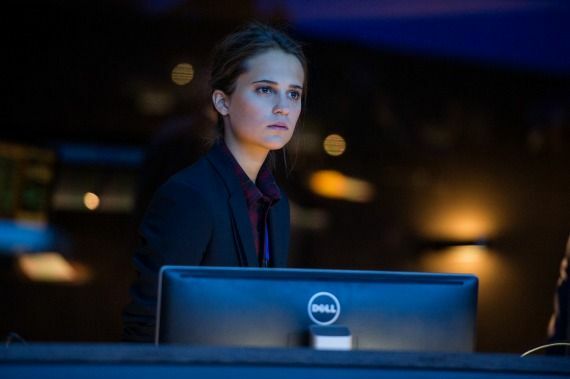 Helping out, at least at first, is young CIA agent Heather Lee (Oscar winner Alicia Vikander). They enlist an assassin (Vincent Cassel) to clean up the government’s mess. Only killing someone like Jason Bourne, who luxuriates in living off the grid, won’t be easy. Rather than reboot the series or have Bourne reveal layers of his old self, the story essentially repeats the same ol’ story beats. Big bad government even has a new, super-top secret program in place. We’re never shown why these programs are necessary. In theory, it’s to protect the country from evil doers. That element rarely gets a fair hearing. Instead, Jones does his gruff and grumble routine while Damon goes through entire scenes without saying a word. Or smiling, for that matter. Damon can convey plenty without dialogue. It still would be nice to get to know Jason Bourne at long last. It’s tough to move his character forward without hearing what he has to say. The same holds true for the franchise. Yes, the film features a fresh subplot involving a new social media platform. The site’s creator (Riz Ahmed) got in bed with the government, and now he’s having second thoughts. That unleashes Hollywood’s latest hand wringing over government spying, the kind rarely attached to a particular administration. Greengrass’s is a maestro at squeezing every last calorie out of an action scene. Yes, he’s still shimmying his camera to maddening effect. But the tight editing combined with that “you are there” perspective hasn’t worn out its welcome. Actually, we do. We’ve seen Damon’s Bourne in four movies now, and we know him better than some of our cousins. The latest “Bourne” takes us to Athens, Rome and even … Vegas, baby. Like the “Hangover” series, “Bourne” can’t really justify its own extension no matter the locale. Do we need another lesson in how the government can’t be trusted? Jones, who in recent years keeps getting roles that let him flash his signature wrinkles and little else, delivers a lip-smacking baddie. Why not throw in a dash of decency for good measure? If we’re living in the age of anti-heroes, it makes sense to invest the villains with some humane qualities. He likely saw a fourth “Bourne” adventure as career insurance. He should have done more than cash the check, though. Maybe the Oscar-winning writer behind “Good Will Hunting” could have penned a new destiny for his signature role? HiT or Miss? Franchise fans will swallow the recycled elements. Everyone else will wonder why Damon even bothered. Imagine if the power went out one day … and never came back on. No phones. No Internet. No running water. “Into the Forest” does feature a man or two, but the primary focus is on how two sisters survive after an unprecedented power outage. This decidedly feminist yarn, directed by Patricia Rozema from a novel by Jean Hegland, imagines a future where patriarchy no longer dominates the culture. It’s rare to see an apocalyptic type tale without zombies or mass anarchy. Rozema’s story boasts quiet pleasures, micro-moments with which any viewer can relate. It still lacks tension and dramatic heft, even when violence lurks with every sudden door knock. Nell (Ellen Page) and Eva (Evan Rachel Wood) live in a sprawling woodland home with their father (Callum Rennie). They’re collectively annoyed when the power goes out one day. Nell is studying for a major test. Eva is obsessed with her dance training. Dad is just happy to spend time with his kids. They initially embrace the power outage, using clever ways to recreate their day-to-day life. Then an accident changes everything. The sisters are suddenly forced to admit the power isn’t coming back anytime soon. Set in the near future, “Into the Forest” features two very different female leads. Page’s Nell is initially headstrong, unwilling to let go of her plans. Eva, by comparison, is laser focused on her career. She spends hours in her personal dance studio, determined to nail an upcoming audition. They aren’t as obsessed with their smart phones like others their age. Still, the sudden death of technology offers a gentle admonition to a culture awash in gadgetry. FAST FACT: Author Jean Hegland says it takes her between 5 to 7 years to complete one of her novels. It’s intriguing to watch how the sisters evolve, for better and worse, in this powerless world. Suddenly, a discarded ball of chocolate becomes a treasure. A few gallons of gas represent a chance to recreate their old life, courtesy of the home’s generator. Survival would be easier if men would stop showing up at their door step. The handsome Eli (Max Minghella) seems nice enough, but he threatens to drive a wedge between the sisters. Other men represent something more sinister, a sign of their old life’s patriarchy. “Into the Forest” eschews dystopian plot points in favor of the sisters’ expanding humanity. It’s not about falling in love or recreating a semblance of society. It’s how women can blaze a trail on their own terms. It fitfully succeeds on that level. It’s just too often a slog getting there. Page and Wood are uniformly strong, and the bucolic forest grounds the story better than similar settings. A third act plot development offers an intriguing curve. Yet it eventually becomes the most conventional element in an otherwise atypical tale. HiT or Miss? Those looking for a fresh take on societal decay with appreciate this quiet tale of survival.